What pushed me more to make this, is the aroma…..the heavenly aroma of cinnamon, vanilla and apples when being simmered altogether….….Wish there was a technology through which you can inhale this lovely aroma….Even lil darling came running to me and asked, mamma what are you making….?? Kutch sweet hain kya?? (are you making anything sweet?? )….I said yeah, for you dear…..smile, hug and kiss…all at a time…no sweet is this much sweet…I said to myself…..simple pleasures of mommyhood…. There is one more reason to make this…..hehehe…you may be wondering….one recipe many reasons to celebrate…..Yeah….With your support, love and vote yours truly ‘Yummy Food’ has been ranked ‘5’ in Crescent Rating. Proud moments are to be celebrated with something sweet. Isn’t it?? This is the first time, my site has been nominated and it has fallen on fifth place…it’s all because of you people…my readers, fans and friends….Thank you…. Last but not least….today being Holi, kutch meetha toh banta hain yaar…..So Happy Holi to all who are celebrating this colourful festival with joy and gladness. Let this apple compote add more sweetness to your festival. In a heavy bottom cooking vessel add diced apples along with cinnamon stick, sugar, vanilla extract and water. Cook on low for 15-20 minutes or until apples turn soft (not mushy). Stir in between. If the compote is too runny, then cook till you get thick texture. Serve lukewarm with crunchy apple flavoured muesli. You can serve apple compote chilled with yogurt as parfait. Just layer yogurt with apple compote in 2-3 layers and top with sliced and tossed almond flakes. You can even serve this over with toasted bread. You can even store this for a week in a clean and dry air tight container in fridge. How wonderful it is when you make a recipe which can be eaten in breakfast or can be served as dessert or can be eaten to satisfy untime hunger and kid friendly too….I tell you the crunchy muesli adds to this luscious compote. 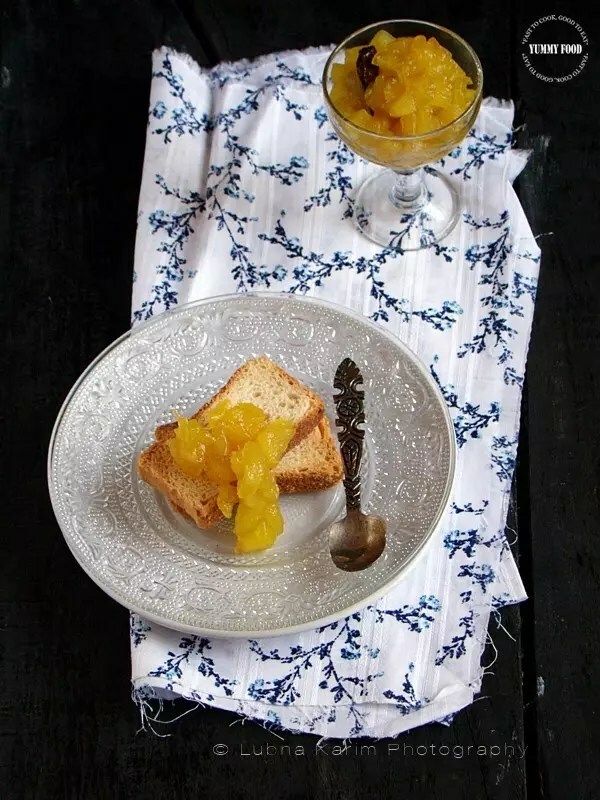 You know, I skipped my lunch and had this yum apple compote with toasted bread…..biting on the juicy compote loaded bread while writing down this post and the house still smells of lovely ingredients used in making this…. An interesting article on ‘making money from a food blog’ at Indian Top Blogs where you few lines have been mentioned which are quoted by me….Read out the article at IndianTop Blogs. Compote and museli looks awesome, would love to finish those glasses without any hesitation. Wow! That compote looks stunning! Beautiful! The idea of such an aromatic dish to entice your little one, is superb. Muesli with it is a great sack idea. I am thinking I'll make this compote, line it with other ingredients like muesli, popped amaranth, curd etc. and make a lovely parfait out of it.